Today I'm featuring the wonderful artwork of Gloria Wilson, which she sells in her Etsy shop, Glory2727. Just browsing through her shop made me smile - the gorgeous, soft colour, and all the pretty flowers! Just look at this lovely field of daisies! This 16 x 20" watercolour features gorgeous speckled daisies. Have I ever mentioned that daisies are my favourites flower? Flowers also happen to be Gloria's favourite subject - and who can blame her when they are as lush as these irises. The foggy background reminds me of the swampy areas where, as kids, we could find beautiful purple irises growing. This 16 x 20" watercolour comes matted and ready to frame. But this Florida artist does paint on quite a range of different canvases. You'll find candle holders, glass bud vases, wine glasses, wooden treasure boxes, note cards and book marks in store. The note cards are prints of original paintings. 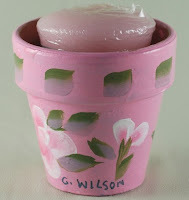 This little pink flower pot candle holder is one of my favourites. I love the baby pink and the leaves with a touch of pink on them. It even comes with a pretty pink candle in the scent "fresh cut roses". What a perfect Valentine's day gift for your sweetie! Alright, I have one more favourite to show you before letting you go check out everything else she has in store. 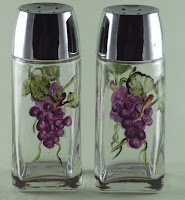 These pick a pair salt and pepper shakers are just too cute to pass up! The succulent grapes look good enough to eat, and they're sure to add some cheer to your kitchen! Plus, did I mention that for every item she sells, she'll donate $1 to the Daytona Beach College Foundation? I think getting an education is one of the most important things one can do, and helping those in financial need is a great cause. Do be sure to check out Glory2727, you're sure to find something! Oh, and make sure to check out her blog too!